Yesterday, the House Energy and Commerce Subcommittee on Health hearing on Improving the Coordination and Quality of Substance Use Disorder Treatment focused on a critical issue: whether pharmaceutical distributors contributed to the opioid epidemic by “pill dumping.” That’s when pharmaceutical companies send large shipments of opioids to areas of the country with small populations, making it easier to divert drugs to the black market for sale at a premium cost, further fueling the opioid epidemic. Executives from five major pharmaceutical distributor companies were questioned about not doing enough in their role of overseeing the sale of legally controlled substances. The companies included Cardinal, Miami-Luken, AmerisourceBergen, McKesson, and H.D. Smith. The executives indicated initial concern about being connected to the opioid crisis through written or verbal testimony, and generally avoided taking any responsibility for contributing to it. Instead, most seemed united in distancing themselves by reinforcing the position that their companies neither prescribe nor manufacture opioids. Specific points included in their testimonies raised troubling inconsistencies. For instance, early lapses in flagging suspicious orders to licensed pharmacies were largely attributed to the use of analog systems. However, some lapses have continued despite electronic monitoring. Distributors purported not to know what happened to data about suspicious orders that was reported to be shared with the Drug Enforcement Agency (DEA), and noted a lack of clarity and consistency about what information required by the DEA. 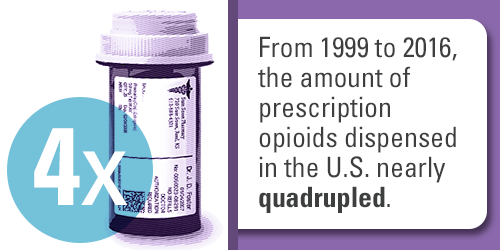 This lack of transparency and cooperation between those in the economic chain of prescription medicines, such as distributors and law enforcement, will continue to thwart success in staunching the misuse of opioids and other controlled substances. Efforts to attack the opioid crisis could be assisted by better educating medical providers about the addictive nature of opioids and better prescribing practices. The diversion tracking programs previously used by distributors were not satisfactory to track bad-acting pharmacies or doctors. The DEA, despite access to the same information as distributors and with a broader picture of shipments to bad-acting pharmacies, did not always take timely steps to mitigate the damage. In their testimony, the distributors appeared largely unwilling to acknowledge the critical role they play in tracking the distribution and diversion of prescribed medicine, as well as initiative in finding a dependable solution as the middleman between prescribers and manufacturers. All seemed to feel confident their current systems are working as planned, discontinuing orders to pharmacies that have reached their cap. However, it is known those caps are set with some level of subjectivity, and there are equally subjective means to bypass the caps. There probably is no foolproof answer to eliminating diversion, but efforts willrequire more collaboration between stakeholders to identify the best opportunities for improvement. Distributors play a critical role in maintaining patient access to life saving, supporting and improving medicines. While they cannot be solely responsible for abuse of legally prescribed medications, their position in the ecosystem of prescription medicine demands they be part of the solution. Note: On May 9, the full House Energy and Commerce committee advanced 25 bills related to the opioid crisis. At this time, distribution accountability is not fully contained in legislation. S.A.F.E. Project will continue to follow this issue. Healthcare Coordination for Substance Use Disorder Patients: Saving Lives or Invasion of Privacy?